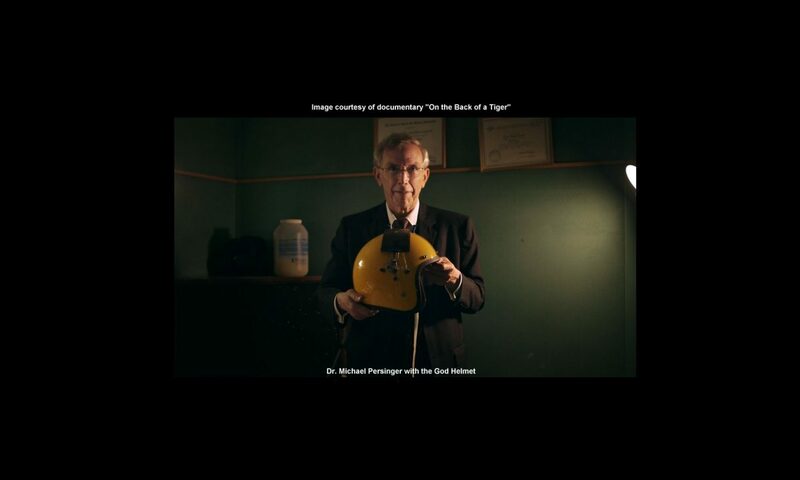 Dawkins had been drinking before his God Helmet Session, and that can interfere with its effects – a Blog by Dr. Michael Persinger. Question: Richard Dawkins is seen drinking wine or wine mixed with soda water (a “Wine Cooler”) before his session with the God Helmet in the BBC video showing his visit to your lab. Had he been drinking before the session? Will alcohol interfere with the God Helmet effects? Answer: Yes, he had been drinking. The scent was easily noticed. In addition, he was obliged to sit in hot lights within the chamber for almost an hour as the BBC director managed several television studio details before the experiment began. This forced us to deviate from our typical protocol where the person walks into the dimly lit chamber and we begin the experiment within a few minutes. We have found that intoxication, particularly ethanol, interferes with the experimental induction of the sensed presence. That is why we always employed an EEG monitoring at the time of the exposure. If the brain state is not optimal, similar to the calm or relaxation that facilitates meditation or prayer, the fields do not optimally interact. In addition, Dawkins had a low score for temporal lobe sensitivity, as mentioned on several web pages (example). Ordinarily, there are ways we can compensate, but these conditions made it difficult. Getting a subject to relax can take time before the session begins, and on that occasion, we were already pressed for time. Interested readers can see “The neurotourist: Postcards from the Edge of Brain Science“, where author Lone Frank, who visited our lab, tells how her EEG showed she wasn’t in the right frame of mind, and we waited until our EEG showed she was ready. BBC procedures and Dawkins’ perfectly reasonable impatience made this impossible. I have not mentioned these aspects of Dawkins experience in our lab as a courtesy to those involved, but the large and growing number of web pages discussing this case has made it clear that withholding these details now serves to distort the truth. Two other prominent skeptics, Dr. Susan Blackmore and Michael Shermer, had phenomena-rich God Helmet sessions in our lab. Michael Shermer (editor of Skeptic Magazine) said that he had “…not only a sensed presence experience but an out-of-body experience as well”, Dr Susan Blackmore said: “When I went to Persinger’s lab and underwent his procedures I had the most extraordinary experiences I’ve ever had,” she says. “I’ll be surprised if it turns out to be a placebo effect.” These are relevant in view of the mistaken online claim that the God Helmet doesn’t work on skeptics. Nevertheless, in spite of these limitations, Richard Dawkins did have some effects, but they were somatic, and not cognitive or affective, as we usually see. He reported a mild dizziness and twitching in his legs and a “twitchy” feeling in his breathing. I hope that this brief blog will lend clarity to this well-known case history. Answer: No, although they do have some things in common with epileptic events (seizures) because they originate from the same source; i.e., moments of instability in the temporal lobes, most particularly in it’s deeper (limbic) regions. Most phenomena that share a common cause are distributed along a continuum (or spectrum) of intensity with degrees of “how much” (or how strong). For example, a few times during their lives, for brief periods, most people display the symptoms that define depression, thought disorders (such as schizophrenia) and personality disorders. However, it is only when the symptoms dominate the person’s behaviours more or less continuously, that the condition is considered abnormal. To employ a metaphor, ordinary religious experiences rely on brief “unsettled” conditions in the temporal lobes, but not full temporal lobe epileptic seizures. In other words, electrical discharges creating EEG (electroencephalographic) patterns which are not unlike epileptic activity can appear from the brain. These do not spread to other areas the way true epileptic seizure activity does. Note that in the above quotation, such activity was read from one sensor, but the other, only two millimeters away, did not detect it. 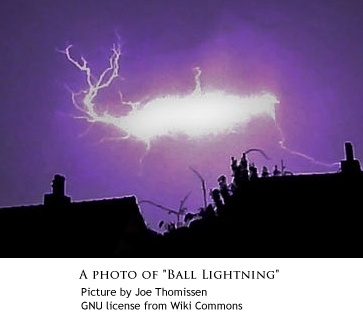 This has been the primary exemplar of microseizures in my work. To clarify further, microseizures are non-epileptic events that mimic seizural activity, taking place in exceedingly small (“pinpoint”) volumes of brain space. My theory of the continuum of temporal lobe lability (offered as an explanation for the wide differences between religious and non-religious personality types and the propensity to report religious experiences) is not based upon the rich literature demonstrating links between religiosity and temporal lobe epileptics (and, more broadly, temporal lobe foci). This link has been repeatedly observed and is still observed in some populations. Instead, my theory is based on laboratory measurements of normal, non-epileptic people. I think it is important to emphasize that the research began and continues to be focused upon creativity and the factors that allow human beings to adapt to complex and ever changing environments and circumstances. Sensitivity, but without actual epilepsy, at the upper end of the continuum of temporal lobe lability is associated with remarkable creativity. Many epileptics have had religious experiences, but only a very small minority of people reporting such experiences are epileptics. Moreover, only a very small percent of all epileptics report such experiences. 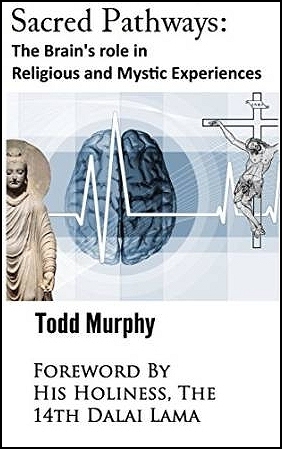 We can easily understand how the relative importance of religion in human cultures has given them a disproportionate prominence in the literature surrounding the study of the neurological aspects of religion and spirituality, i.e., the field of neurotheology. The sensed presence is a primary feature of above-average temporal lobe sensitivity. It has been given different labels that range from the Muses of the Ancient Greeks to the “spirit guides” of contemporary New Age religion and philosophy. My working explanation is that the sensed presence is the left hemispheric awareness of the right hemispheric equivalent of the sense of self. We have demonstrated the direction effect across the two hemispheres and lobes by neuroimaging. Goldensohn ES. Initiation and propagation of epileptogenic foci. In: JK Penry and DD Daly, editors. Advances in neurology. New York: Raven Press; 1975. Matt Stead (et al.) “Microseizures and the spatiotemporal scales of human partial epilepsy” Brain. 2010 Sep; 133(9): 2789–2797. Goldensohn ES., “Symptomatology of nonconvulsive seizures: ictal and postictal.” Epilepsia. 1983;24 Suppl 1:S5-21. Answer: The answer to the question, as stated, is “no”. The microscopic connections between brain cells which are associated with certain patterns of behavior (These patterns are called personality in the vernacular) are altered by conditions within the temporal lobes that encourage frequent and very specific types of electrical patterns. Only very extreme brief electrical activity that involves large volumes of the brain defines epilepsy. Its important to differentiate three components: religious experiences, religious beliefs and religiosity (the propensity for interpreting events in terms of religious beliefs, as well as participating in religious rituals, showing reverence for religious symbols, etc.). A religious experience will include perceptions that involve multiple areas but particularly the temporal lobes because they contain the amygdala which is involved with meaning and affect and the hippocampus, which is involved with memory. However, like any other experiences, religious or spiritual events are encoded into verbal images. This involves or “recruits” the frontal portions of the brain. Even when its subtle, the way a person labels the “cause” of a mystic experience, or what they attribute it to, is supplied by the person’s culture and learning history and this can have a significant effect on how they remember the experience hours to days later. To offer a mundane example, people often hear words that upset them (for example, during arguments). After the event has passed, they are very likely to speak of it referring to the words that made them angry or sad, and not a description of the discomfort they created. The explanation supplants memories of the actual event. This also happens with religious experiences. The phenomena are recalled as instances and verifications of the themes in their religious beliefs. The images associated with the words that we use to label a religious experience, without actively doing anything, strongly affect what we later remember as true. A religious belief, like all beliefs, is a cognitive strategy. Religious beliefs attempt to anticipate both events in the world, and our life experiences (including religious experiences) and organize their meaning. Religious belief is different from a religious experience. A delusion differs from a belief to the extent that it affects the person’s explanations and perceptions of his or her own private world. Religiosity is the degree to which the experience infuses what the person perceives, thinks, and believes about the world and explains the Cosmos. Delusions have implications about the person who has them, while religiosity includes beliefs about the entire universe, including its origins and eschatology. Given that science also offers a cognitive strategy for anticipating events and interpreting their significance, maintaining a religious ideational framework (“belief system”) and its accompanying paradigms cannot be regarded as an epileptic phenomenon. I’ve just finished a new (second) edition of Sacred Pathways: The brain’s role in Religious and Mystic Experiences“. I remain grateful to both H.H. The Dalai Lama, and Dr. Michael A. Persinger for providing forewords to my book. Although the reader feedback for the book is very positive, a couple have commented that they found proofreading errors, and asked that they be fixed. I have done so. In addition, I’ve made smaller additions throughout the text, as well as adding references for many statements. Preparing the text for the second edition was a very fulfilling job that sent me back to the drawing board, and I learned a few new things along the way. One important change is that recent evidence shows that only a small portion of the anterior commissure (AC) connects the two amygdala, which makes it even more likely that it would be changed during a dramatic spiritual experience. Interestingly, most of the AC fibers connect the temporal lobes with each other. In other primate species, they are exclusively dedicated to connecting the two amygdala to each other. Another is that there is more emphasis on the role of the frontal lobes in such experiences, especially with respect to their connections to the brain’s reward circuits. None of these changes call for any alteration in the book’s basic hypothesis, that religious and mystic experiences represent excitement in the “Sacred Pathways” that we evolved to support the death-process, as made explicit in Near-death experiences. There are a few more illustrations, of brain circuits, some of the saints mentioned in the text, and of Yama, the fascinating lord of The Underworld in the mythologies of India, Thailand, China, and most of Southern Asia. I’ve also put it into Amazon’s “Matchbook” program, so if you buy the paperback edition, you can get the kindle version for 1/3 of the regular price. I don’t know why anyone would want to read it in both editions, but Amazon seems to think its a good idea, and they know more about kindle readers than I do. It’s available in Paperback and Kindle E-Book.